As current events overwhelmingly decree, our planet is creaking under the weight of hate and wailing for peace and balance. 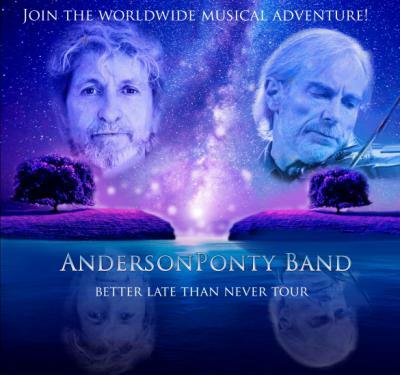 For the musically astute and love-filled at heart, an unimpeachably brilliant and joyous new collaborative project between pioneering jazz-rock fusion electric violinist Jean-Luc Ponty and uber-optimistic singer/songwriter Jon Anderson, former front man of the progressive rock band Yes, is the soundtrack of hope at its most passionately sought and prayed for. Leaping over perceived pigeonholes in glorious strides and bounds, Anderson and Ponty have pooled their catalogs to create the most humanity reconfirming musical offering of 2015 – the 14-song CD/DVD Better Late Than Never.